Pondering religion has me taking a look at Cuba and Santeria. 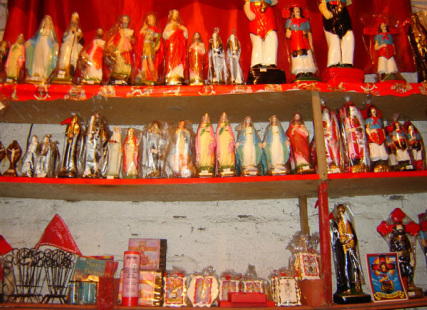 The birth of Santeria is unique in that it sprang from a measure of tolerance by Spanish invaders. Spanish plantation owners allowed their slaves to form clubs called Cabildas; a place where African slaves melded traditional Yoruba faith with Catholicism. What sets this apart is that it happened around the same time Spanish conquistadors were obliterating indigenous civilizations in Mexico and South America. No question the Spanish had no God but their own in mind, that said it’s fascinating Santeria was tolerated. Perhaps it seemed harmless enough as it wasn’t part of local culture. They were businessmen for the most part who might have recognized the benefits of keeping the peace.I suspect the clever practice of referring to Orishas; Santeria Gods, as “saints” duped Spaniards into thinking the imported work force was toeing the line. Santeria believes in over twenty Orishas; Gods able to wear many different “masks” therefore perceived in other cultures as their own holy figures. It has no text, and is passed on by word of mouth. Money isn’t wasted constructing places to worship; ceremonies take place in private homes or rented spaces. It worships nature, and takes a holistic approach to healing. Followers are given a “mother” and “father” Orisha in ceremonies conducted by a priest. Orishas have different colours associated with them; followers wear beads to identify their mother and father. Offerings known as ache are sometimes made in the form of blood from animal sacrifice.For this reason many people think of it as Voodoo, a misconception built on one tiny aspect of a rather complicated faith. It would take hours to explain the intricacies of Santeria. My kindergarten overview doesn’t do justice to a faith born and raised for no purpose other than to help its followers. Santeria doesn’t knock on your door with newsprint pamphlets, it doesn’t care what others believe or pass moral judgement. It focuses on drawing strength from within, and honouring nature. It accepts all faiths and welcomes anyone who knocks on its door. Perhaps this helps to explain the joy found in Cuban people. People who laugh and sing despite the lousy deal they’ve been handed. Ponder our world if we took a lesson from Santeria and kept religion to ourselves. A world free of church leaders sitting on piles of plundered wealth, free of hatred, judgement, and the belief it mattered one iota which afterlife any of us found ourselves.